The first day of Kallol Durga Puja 2012 concluded just couple of hours ago. This is a unique feature of Kallol, to celebrate Durga Puja for three days – Friday, Saturday and Sunday. Not too many Bengali clubs of North America can boast of this feature. It is more homely and informal in nature and the crowd is manageable. People walked in leisurely, picked up their passes and parking tickets and strolled into the hall while greeting friends on their way. Pretty ladies dressed in designer saris busy complementing each other and posing in front of eager camera men, men in colorful kurtas hanging around with tea and cigarrettes, and children in cute dresses running around the hall made the festive mood just perfect. After a sumptuous dinner of Khichdi, Labra, Alu-bhaja, Chutney and Langcha, the entertainment programme started with a dance recital by students of Mitra Purakayastha. This was followed by a music and dance presentation by talents of our next generation who were picked after a rigorous auditioning process. 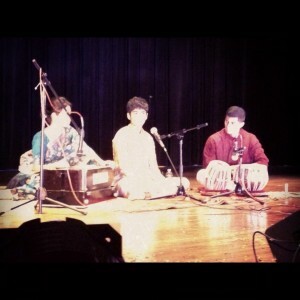 Shankhadeep Chakrabarty (accompanied by Shiladitya Bhawmik on Tabla and Ujjaini Ghosh on Harmonium) presented three popular semiclassical numbers. Trina Sanyal and Anisha Ghosh presented western vocals followed by a dance recital by Ishita Bhattacharya. The concluding event was a gala performance by Arnab Chakrabarty. No Bengali festival is complete without shopping. The hall was surrounded by sari and jewelry stalls, Bengali snack stall by local restaurant Calcutta affair, books and CDs by Muktadhara and many others. Tomorrow (Saturday) the festivities will include a hilarious play “Tulkalam” directed by Arunansu Dasgupta, a childrens drama, and a musical performance by Sadhna Sargam. So tuned in for further updates.